Our newborn daughter is not so newborn anymore. 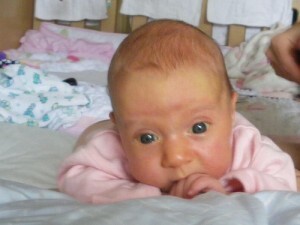 She is now six-weeks-old-born, and I am left staring at the rearview mirror, wondering where the time went. Needless to say, she has grown significantly during this time, and has even more personality now than ever before. (I would say her personality during the first week or so could have been described as “Avid sleeper that enjoys long naps in the sun with the occassional break for some good quality breastmilk.”) Now that six weeks have gone by, I can say a bit more. Basically every waking and sleeping moment! We are really proud of her and are looking forward to more. I will keep you updated on how things go. If she starts to read the newspaper anytime soon, you will see a posting here immediately, as well as in the New York Times.